Gardaí said that one in 10 of these arrests were people driving “the morning after”. GARDAÍ ARRESTED A total of 938 people on suspicion of drink or drug driving since the beginning of December, the force revealed today. Gardaí said that the 938 drivers had been arrested on suspicion of driving under the influence of alcohol or drugs since the beginning of its Christmas and New Year road safety campaign. They said that one in 10 of these arrests were people driving “the morning after”, meaning people who may have been still above the legal limit after consuming alcohol the night before. 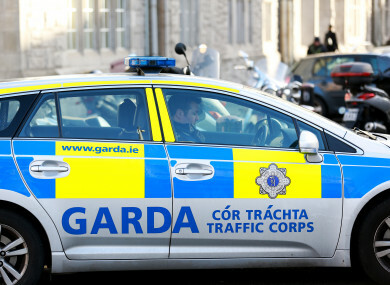 “An Garda Síochána will continue to focus on these high risk drivers throughout 2019,” gardaí said in a statement released on Twitter. “It’s a choice to drive intoxicated – and a potentially fatal one. Never, ever drink and drive. Gardaí said that they arrested a total of 8,753 drivers on suspicion of driving under the influence of drink or drugs in 2018. As well as this, over 130,000 drivers were detected breaking the speed limit last year, and just under 30,000 were caught holding a phone while driving. New drink driving laws came into effect last year which see an automatic disqualification for drivers on their first offence of driving while over the permitted 50mg of alcohol per 100ml of blood. Email “938 drivers arrested on suspicion of driving under influence of drink or drugs since start of December”. Feedback on “938 drivers arrested on suspicion of driving under influence of drink or drugs since start of December”.